TAURANGA, New Zealand, April 9, 2012 (ENS) – Maritime New Zealand has charged the owner of the cargo vessel Rena after the ship ran aground on Astrolabe Reef off Tauranga last October. The grounding unleashed New Zealand’s biggest maritime environmental disaster as least 350 tonnes of oil and hundreds of containers spilled into coastal waters. The disaster worsened Wednesday when the aft section of the Rena sank due to ongoing rough seas pounding the weakened structure. A light sheen of oil has been observed stretching about one kilometer northwest of the wreck. The total amount of oil left on Rena is “in the tens of tonnes, located in a number of pockets around the wreck,” says Maritime New Zealand. Recovery of the rest of the oil is the priority of the salvors and Maritime New Zealand but strong winds and rough seas continue to impact recovery operations. 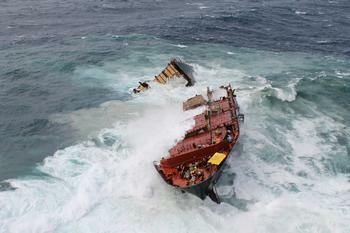 The forward section of the vessel is holding on the reef, but is being buffeted by seas mounting as high as 12 meters (40 feet), causing further damage. The 21-year-old, 236 metre (775 foot) long Liberian-flagged cargo vessel was heading towards the Port of Tauranga from Napier, carrying about 1,700 metric tonnes of fuel and more than 1,300 containers when she ran aground on October 5, 2011. Greece-based Daina Shipping Co has been charged under the Resource Management Act 1991, which relates to the “discharge of harmful substances from ships” in a coastal marine area. The charge carries a maximum fine of $600,000 and $10,000 for every day the offending continues. Daina Shipping is the registered owner of Rena with overall responsibility for the operation of the ship. Incorporated in Liberia, Daina is one of 80 subsidiaries of the Greek shipping company Costamare. The charge was laid in the Tauranga District Court April 5 and is expected to have its first call on May 25. To a charge of “discharge of harmful substances from ships,” the master pleaded guilty, but the second officer entered no plea. If necessary, a two day hearing will take place in May to hear legal arguments in the second officer’s case. Both men also pleaded guilty to charges brought under the Crimes Act, alleging they “wilfully attempted to pervert the course of justice” by altering ship’s documents subsequent to the grounding. The two men are scheduled to be sentenced in the Tauranga District Court on May 25. Their names and identities have been suppressed by authorities. 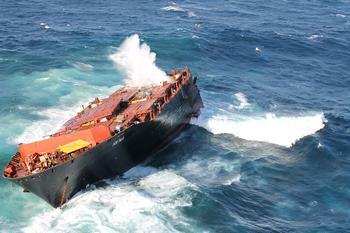 Maritime New Zealand and the salvage company, Svitzer, are continuing to monitor and assess the condition of the wreck. They will attempt a closer inspection of the wreck when conditions allow. Boat skippers and vessel masters are reminded to take extreme care, as the debris from the wreck poses a significant risk to shipping. A two nautical mile exclusion zone remains in place for the Astrolabe reef. An interim report by the Transport Accident Investigation Commission released in March details how the Rena deviated from its intended course as it headed to a 3:00am meeting with the Tauranga pilot boat. At 1:50am, the report says, the Rena was on a direct track for Astrolabe Reef. “At about 0205 (2.05am) the master noticed an intermittent echo on the radar. The echo was about 2.6 nautical miles (4.8 kilometres) dead ahead of the Rena. The master showed the echo on the radar to the watch-keeping able-bodied seaman and they used binoculars to look through the windows of the bridge for the cause of the echo. They could not see anything, so they moved to the bridge wing to look from there. When again nothing could be seen, the master said he decided to plot the Rena’s position on the chart, so began to walk through the wheelhouse to the chartroom,” the report says.